Like Merchant Ships: This Kid Is Dynamite! This is what happens when a four-year-old has been praised a little too heartily for his recent independence. The buckling his own car seat I love; the bicycle helmet worn as a fashion accessory and the clothespins clipped all over a belly-baring undershirt, I can do without. At this rate, he's fast becoming the Napolean Dynamite of the preschool set. He did melt a few hearts today as we entered the Fresh Market this morning. He shooed me away from the carts, carefully choosing one himself. "No, no, Mama. You don't need to lift a finger. Let me do all the pushing for you," he gallantly insisted. The crowd of ladies in the floral department sighed in unison. As soon as we rounded the coffee display, he let me in on his true intentions. "You know, if I'm driving the cart, I can speed right past the vegetables and get to the cookie counter a whole lot quicker." He is too cute! And I'm with him - On to the cookie aisle! There must be something about four year olds and bicycle helmets! 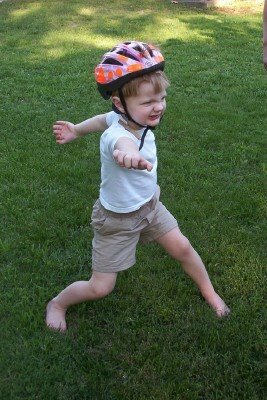 Our four year old son, Alex, wears his bicycle helmet ALL THE TIME, and pretends that it is his army combat helmet. In addition, he wears thin stretchy gloves that he says are his army soldier gloves....he looks so cute that I don't make him take it off very often. The blessing of all of this is that I can just enjoy it. My oldest son is almost 16, so I know that things like this are very fleeting, and also pretty precious. And your big boy is REALLY going to seem like a big boy once you have your little girl. It's almost as if they grow up in just the course of a few days once you have a new baby; kind of like you suddenly realize that they're really not a baby anymore. Too bad our 4 year olds can't get together. Mine would love to help yours lay waste to the cookie counter! You have such a handsome son. Ha, ha! I have a son with a very similar mindset. Oh so funny. What a kid. I just love some of the things they do, and the things they say. Where would a 4 yr old pick up the phrase "you shouldn't have to lift a finger". Kids are just great. And I think it is great that you are nurturing his individuality. After all, it won't be long before peer pressure kicks in. Also, I always figure at this age they have so little control over their lives that allowing them control of a few little things, like what they wear, is good for them psychologically. (can ya tell I was a psy maj in college-I learned just enough to be dangerous) Princess picks out her own outfit every day-and as long as it covers all the correct body parts and is warm enough I let her. Even though yesterday she wore a pair of flowered pants and a wildly printed surf board t-shirt. Ohh, can you say clash? And she'll tell me "mama, I look beautiful!" I loved this - hope you don't mind that I used it in the Carnival of Kid Comedy.